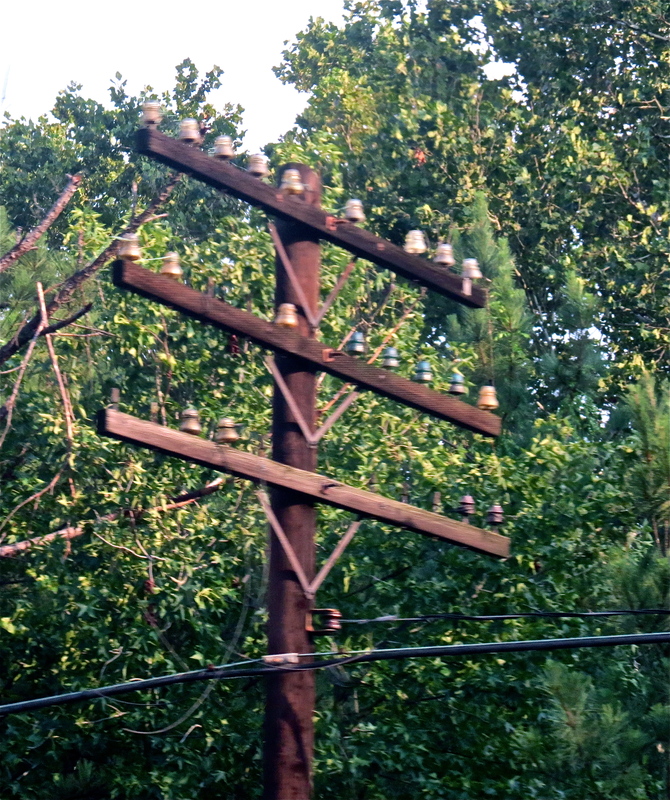 So what is so interesting about telephone pole insulators? 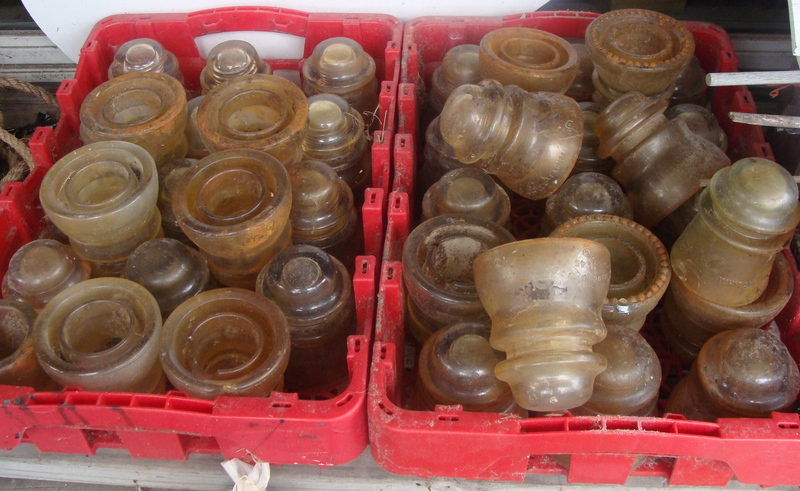 My curiosity about insulators started before I even knew what they were. A friend of my son’s stayed at his home for a few days and left a glass, lantern-like object in appreciation for hospitality. A neat little piece, the glass cylinder found a permanent display place in John and Jim’s living room. 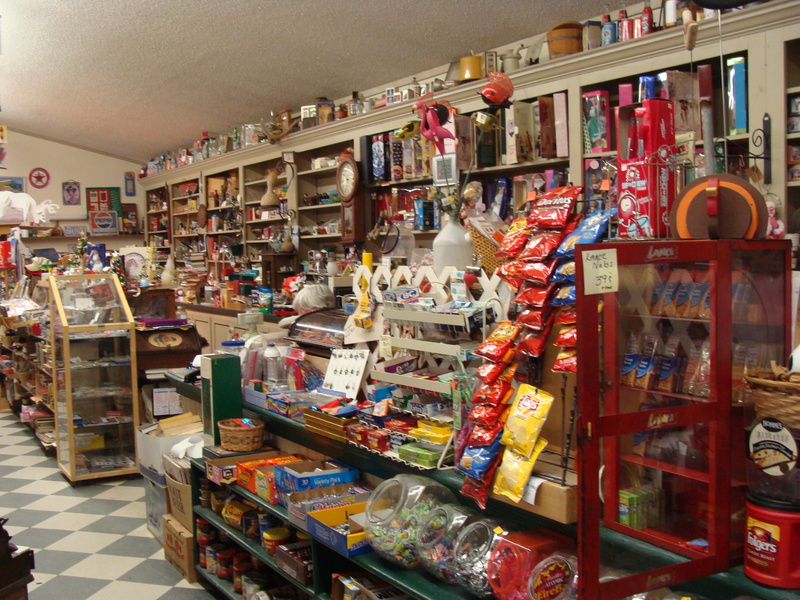 This summer we drove down to the Outer Banks, and on the way we stopped at one of my favorite antique shops, The Peck Basket, which resembles an old-fashioned general store. On one of the shelves I came across a similar lantern and asked what it was. The proprietor informed me that the object was an insulator, one of those glassy objects that sit atop cross arms of telephone poles. Someone had given her an entire box of them. During slow periods in the store, she washes them up, and then sells them on Ebay, sometimes for $40 each. I can’t ever remember paying any attention at all to telephone poles, but for some reason I could recollect that there were in fact glass cylinders that held the wires. After some research, I read that without insulators, electricity could leak into the pole. I also discovered that these little class cylinders are quite collectible. During the 1960s the electric companies began replacing the poles and moving wires underground and insulators were just thrown out. Folks realized that these discarded objects were quite beautiful, ranging in a variety of colors, shapes and sizes. The colored glass sparkles when placed in a sunlit window. On the web several insulator clubs share information and hold local and national shows. Books and magazines describe insulator history as well as their prices, which range anywhere from a few dollars to $20,000! If you get interested, find an informative web page here, Stories of a Northwest Insulator Nut, set up by a dedicated collector. So if you are looking for a “Hemingray-9, CD 106”, used in rural telephone systems, you’ll be able to find it.